Many people easily confuse modern rattan furniture with modern wicker furniture. The difference is that wicker isn't actually a material - it's the process of making furniture. Therefore, a piece of modern furniture can be both rattan and wicker. Natural modern rattan outdoor furniture looks really good in appearance but it's not weather proof. In other words, you cannot leave it outside the whole year. Because it's a natural material, it can also potentially mold. This is why synthetic furniture was developed. 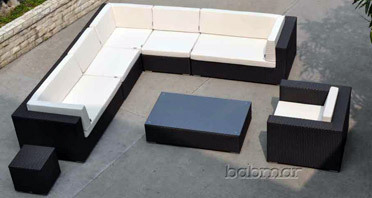 Synthetic rattan is made of polythene, polycarbonate and some recycled plastic materials. This material can be made anywhere in the world because it's readily available. Just like all weather wicker, synthetic rattan is very resistant to all weather. Therefore, it can be left outside all year. Synthetic rattan is an extremely efficient material that can save you a lot of money and hassle in the long run.